On a recent post regarding some new additions to my makeup brushes I said that I wanted to get a new makeup bag to store my brushes in. Although I have the panoramic case from the Real Technique’s Core Collection, which I think works well as a display stand, I’m not happy to use this as a travel case for two reasons. The first of these is that the case is open around the edge’s and I’m concerned that any thinner brushes I add that do not have a custom sized slot in the elastic may slip and fall out of the case. The second reason is that when closed there is not a lot of room in the case. If you have some of the larger brushes, such as the blush and powder brushes, I think these may get squished out of shape. So I headed down to Boots to hunt out the perfect bag for storing brushes in. 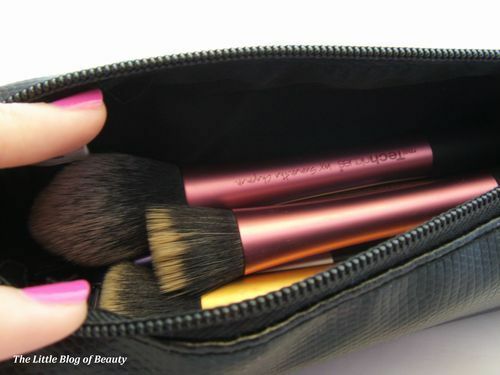 When I was wandering around I spotted this little bag nestled in the middle of the No7 brushes. 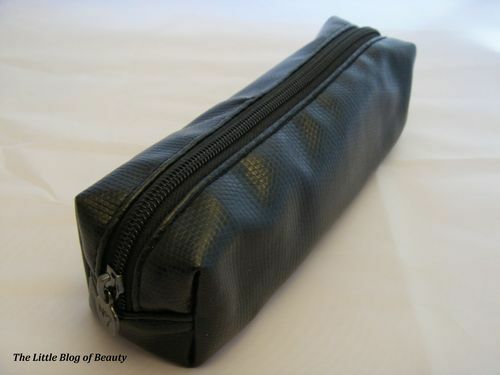 Although on the Boots website this is called a cosmetics bag I’m sure on the packaging (which I have obviously thrown away now) this was actually called a makeup brush bag. I’m not a big fan of snake skin effect type things but this is the perfect size and shape for storing brushes in and all the other makeup bags they had were way too big for what I wanted. I also thought the price was pretty good at £8.50. Then the thought struck me, hold on I have one of those No7 makeup and skincare vouchers. I quickly searched through my bag for it and bingo, the makeup voucher could be used for makeup accessories. So with £3 off I got this for the bargain price of just £5.50. The bag measures approximately 21cm x 7cm x 7cm. I have added my Core Collection (detailer brush, pointed foundation brush, buffing brush and contour brush), brow and lash comb, three eye brushes, blusher brush and stippling brush and there is still plenty of room for at least a couple more large brushes. 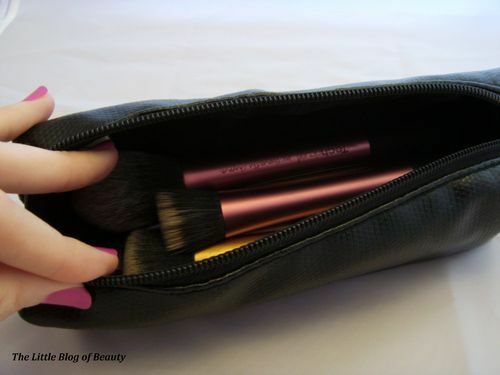 If you are looking for a makeup bag specifically for storing your brushes in I would highly recommend this one. Although the No7 vouchers have now expired this is currently part of a buy 1 get the 2nd free offer on selected No7 cosmetics. 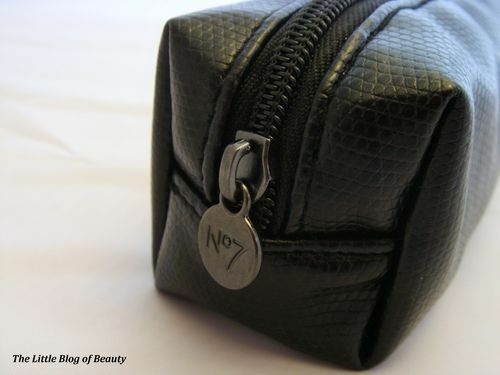 So if you are looking to buy some No7 makeup this would be the perfect time to pick this up. You can get this bag in Boots stores or on the Boots website.